To purge the cupboards or not? That is the question. And there is no "right" answer. Growing up, my home was not completely free from allergens. My brother and I both had anaphylactic allergies: mine to dairy, nuts, peanuts, legumes, egg, chicken, pear and soy (I grew out of all of them except soy protein, legumes, dairy, nuts and peanuts) and his to nuts, peanuts, mollusks and mould. My parents did their best to make sure there was no cross-contamination in the home so that we could always be comfortable, but they were also new at the whole allergy thing, too. There were no online resources or forums to refer to about this sort of thing so they trusted their judgement in how best to go about ensuring neither of us had a reaction. We had milk and, rarely, butter in the fridge. My dad often snacked on home-roasted chestnuts, my mom took cream in her coffee, my brother enjoyed eggs for breakfast and cheese on his pizza, and I was obsessed with seafood. There seem to be a lot of opinions out there on whether or not your home should be completely free from allergens if you have an allergic child, roommate or significant other. I think the correct answer is that it's totally up to the comfort level of the person with allergies. In the case of a child having allergies, it's up to the parent to determine what they can manage. 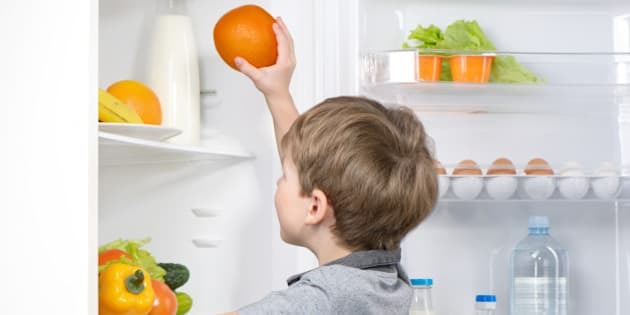 There are a number of ways you can keep your allergic child's food separated, from writing their name on packaging to indicate it's safe to having a separate fridge for their food if you are able to (I learned that trick from my sister in-law) or a dedicated shelf in your fridge. If it makes you feel at ease to have the whole family go allergen-free, then go with your gut. When it comes to roommates or significant others I've learned that generally if they care about you they'll want to make sure you're safe. I know this sounds like an obvious realization, but I'm so used to feeling like an inconvenience to others that sometimes it's an easy thing to forget. I've had roommates that I wasn't previously friends with and for the most part they all went out of their way to make sure cross-contamination didn't occur in our kitchen. One of those former roommates is now one of my closest friends and helps me run my site, Everyday Allergen-Free. I did, however, give them a full run-down of how to keep the kitchen "safe" for me and kept a list of my allergies and common foods I avoid taped to the fridge. I cooked for them all the time so we often enjoyed meals together. My advice is to be selective with whom you choose to live, and give them a lot of training and info regarding your dietary restrictions. In terms of living with a significant other who does not have allergies, the same rules from above apply. Being with someone who cares about my safety and preventing reactions means that although we have a miniature carton of milk in our fridge, I don't have to worry about it ending up in my food or lingering on shared surfaces. For the most part though our home is allergen-free. The only exceptions being milk for coffee, takeout food, and maybe the occasional pudding or yogurt cup. Some tips I would suggest for families, couples, or roommates who are new to food allergies are as follows. Ask your allergist for advice or names of common additives to avoid. Ask your partner/roommate for advice and guidance regarding specific or situational scenarios. Ask other allergy parents for tips on how to deal and what's worked for them. If you're unsure about an ingredient, don't use it. It's so much safer to ask about it or email the company for clarification later than to just use it and hope for the best. Even if it's an ingrained habit, avoid dipping utensils into different foods. Maybe you're used to spreading butter on your toast and then using that same knife to spread some jam, but that will cause cross-contamination. If you do double dip by accident make sure you label the product and make it known. Clean, clean, and clean again. After you cook -- clean up. After you finish your takeout - clean up. You can see the pattern here. Constantly cleaning up is a proactive way to prevent cross-contamination. There's nothing worse than seeing someone touch or use a surface, utensil, or plate that's contaminated without their knowing. That's unnecessary stress that no one needs. I like to keep an assortment of spray cleaners handy in my kitchen so that I can sanitize on demand. I've made a habit of wiping down surfaces with a household cleaner daily or whenever splatters occur. Allergens linger on hands the same way they do on surfaces. Wash with soap often to avoid the spread. After all that cleaning, it would be a shame to taint it with contaminated fingers! Get a sharpie and mark things that you can or cannot have. Just make sure to be consistent so as to avoid confusion. Keep a note taped to your fridge. Create a simple chart with a list of your allergies, other names they go by, and what foods to avoid. Tape it to your fridge or someplace visible until everyone is comfortable.